Acting is one of the most fear-inspiring and joy-deriving pursuits I’ve known. From the underground boards at La Mama Theatre, performing equally underground and subversive plays, to the splendid space of Union Hall at Adelaide University, I have always enjoyed the challenge of filling and using the space in which we were performing. 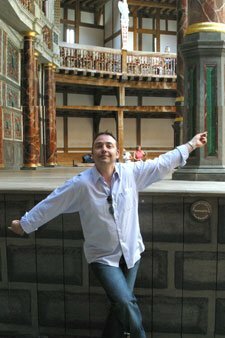 A highlight for any stage actor is a visit to The Globe Theatre in England and one to Stratford-On-Avon, the home of Shakespeare. While theatre has become more embracing of the audience and more post-modern, there is still something about theatre done the way it was by Shakespeare and his contemporaries that balanced nicely the suspension of disbelief with the acknowledgement of actors playing roles for audiences. To read more about another Steve Davies actor read this entry. If you are a fellow “Steve Davis” working in this field somewhere else in the world, leave a comment and link, below.